Did you get yours yet? Leave a comment below and tell us about it! Hello from a new reader. 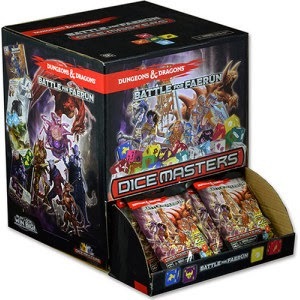 I haven't really gotten into Dice Masters before because just too many superhero games. But when I heard of a D&D; themed version I have been going crazy to get it. But my local shop not only doesn't usually carry any Dice Masters (No Minsc & Boo!). My special order for a starter wasn't in todays order! I picked up a starter and around 20 gravity packs with my son today. We both thoroughly enjoyed the new cards and dice. Both the cards and dice look really good. The cards we've seen are very thematic and play well within in the set. There are a lot of new fun abilities that we haven't seen before. I'm not really a D&D; fan but they hit a home run with these. Got mine! Played in a great release event at my local shop too! Got mine tonight. This set was so much fun to play, from my 5 boosters I had plenty to start. My favorite combo was ramping with a basic action for early M&B; buy, then Elf Wizard/Resurection to get M&B; to the field right away. My opponents first turn was 4 Kobald buy out! This version is so amazing so far.